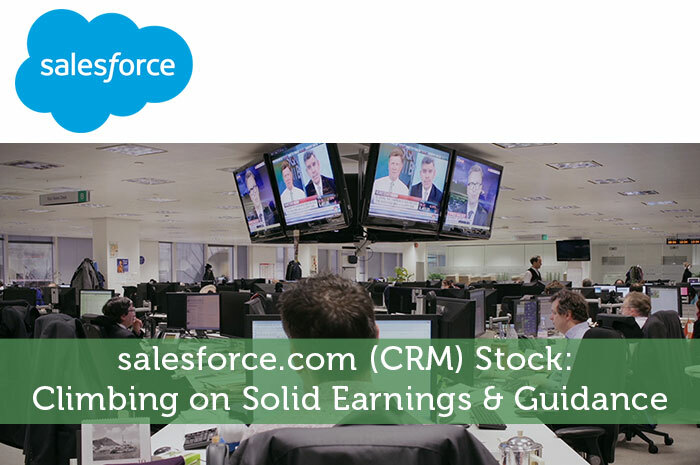 Earnings – In terms of earnings, CRM definitely did not disappoint. During the first quarter, analysts were expecting that the company would generate earnings in the amount of $0.23 per share. However, the company proved that earnings came in slightly ahead of expectations, reporting $0.24 per share. Revenue – While earnings were indeed positive, revenue was even more uplifting. During the first quarter, analysts expected that CRM would generate total revenue in the amount of $1.89 billion. However, the company actually reported revenue in the amount of $1.92 billion. Not only did this blow away analyst expectations, it proved a year over year gain in the amount of 27%! Q2 Guidance – Just in case producing strong earnings and revenue for the first quarter wasn’t enough, salesforce.com also released expectations with regard to the second quarter. During the quarter, the company is expecting to generate earnings in the range between $0.24 and $0.25 per share. When it comes to revenue, the company is expecting for the figure to come in between $2.005 billion and $2.015 billion. Earnings are right in line with analyst expectations of $0.25 per share. However, revenue is well ahead of analyst expectations of $1.98 billion. As investors, one of the first things that we learn when we get started in the market is that the news causes movements. Any time we see positive news with regard to a publicly traded company, we can expect to see gains in the value of the stock associated with that company as a result. Adversely, when negative news is released surrounding a publicly traded company, we can expect to see declines. In this particular case, the news that was released was overwhelmingly positive. So naturally, we’re seeing a positive reaction in the value of the stock. Currently (11:24), CRM is trading at $80.57 per share after a gain of $2.70 per share or 3.47% thus far today. Moving forward, I have an overwhelmingly bullish expectation with regard to what we can expect to see from salesforce.com. The reality is that the company has become the number one lead source for sales companies inside and out of the United States. Aside from leads, the company has a number of great products, a great team, and great management. Combine all that with a solid plan for growth, and it’s hard to imagine that the stock would see any meaningful declines moving forward. Where do you think CRM is headed and why? Let us know your opinion in the comments below!